In addition to its stem with many constrictions, this wineglass features wings, pincered bits, and a merese. This goblet is built on the blowpipe. That means that successive elements are stacked up to create the vessel. This first gather will become the cup, or uppermost part of the vessel. 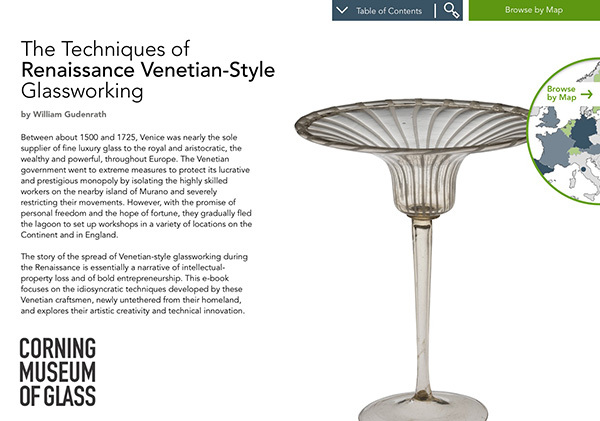 The hot glass is elongated slightly with gravity, and it is gently rolled back and forth against the brass table called the marver. This makes the glass a little longer, a little tapered, and perfectly concentric with the blowpipe. Air is blown in, and the bubble forms. It’s necessary to cool the tip of the bubble a little bit, and this is done by rolling just that part on the marver. The cold metal rapidly cools the glass. After reheating, the glassblowing can begin to form the cup. A constriction is made near the blowpipe. And using a rubber tube, air is blown into the pipe as tooling takes place to shape the uppermost part of the goblet. The constriction must be narrow and somewhat weak. Decorative constrictions are made. And after reheating, excess glass at the bottom is trimmed free. A small bit of glass freshly gathered from the furnace is added to the tip of the goblet and tooled to become a merese. This is a decorative disk to which will be attached the stem. The merese is left slightly conical, and a second gather is made on another blowpipe, marvered, a bubble blown, elongated with gravity, marvered to a slight taper. It is then lowered into a dip mold (or optic mold). It is blown hard, and that creates the ribs. A broad constriction is made. This is carefully placed on-center on the tip of the merese, the first blowpipe twisted to create the twisted pattern. Decorative constrictions are made, and the stem is trimmed to its final length. Another bit of glass is added to the tip of the stem, and another merese formed. 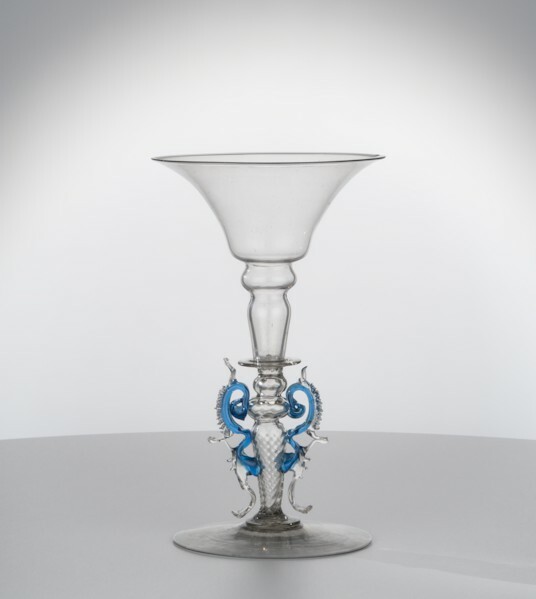 The glass is gently pressed upward onto the stem to ensure there is a strong join between the two. A third bubble is lowered onto the merese; this will become the foot. After trimming it free of the blowpipe, a constriction is formed. The excess glass is trimmed free, and this leaves a hole, and the edge of the hole will become the edge of the foot. The foot bubble is reheated and then tooled. The soffietta is used to cool the lowermost part of the stem. That unavoidably becomes soft while reheating the foot bubble. The foot is given its final shape. The punty is attached. The punty will act as a handle. The neck is broken, and the edge reheated. Throughout the process, it is essential to keep all parts of the structure well above 1000 degrees Fahrenheit, or cracking will likely occur. The final shape of the object is created with the jacks, with the soffietta, and ultimately centripetal force is used to give the final flare. The wings begin with a flattened mass of aquamarine glass. This is trimmed free of the gathering iron, pulled downward, and a second contact point it made. 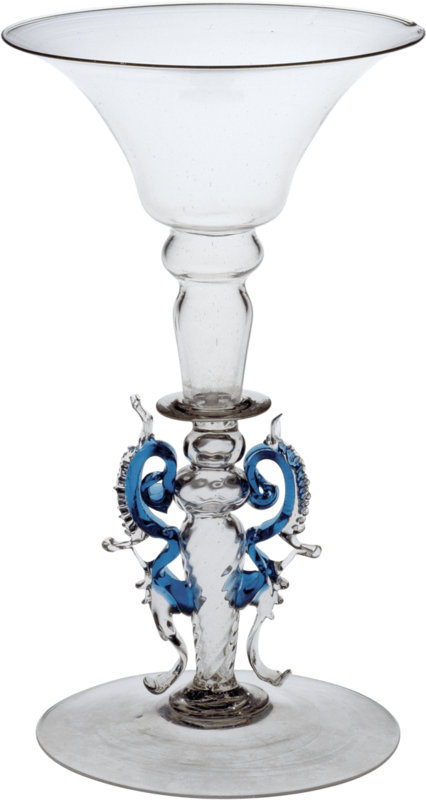 The pincers are used to shape the glass. Being careful to keep the entire object above 1000 degrees, the final parts are added. And these are clear, decorative elements, placed on the outside edge of the wings, cast off, and manipulated with the pincers to form a denticulate pattern. After the work is completed, the entire object is flashed in the furnace and broken free of the punty. It is then placed in the annealing oven for slow cooling.